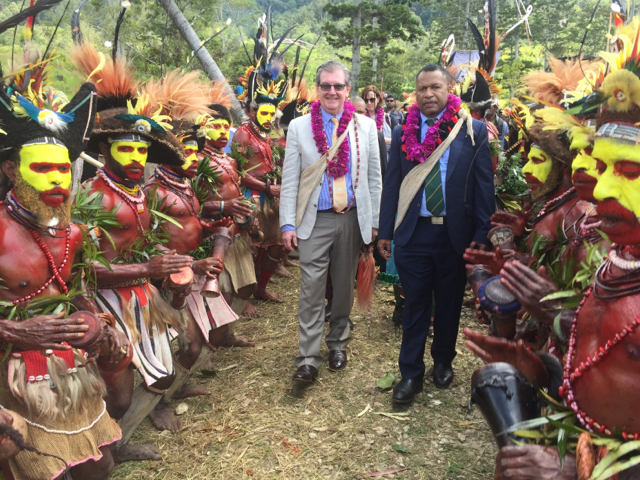 The Government of Papua New Guinea, Australian Government and Oil Search Foundation are working together to support provincial health Authorities to deliver improved health outcomes in Hela and Southern Highlands provinces. Australian High Commissioner Bruce Davis (left) during one of his visits to Hela with the Member for Koroba-Lake Kopiago and Minister for Immigration Border Security Petrus Thomas. Member for Koroba-Lake Kopiago and Minister for Immigration and Border Security Petrus Thomas presented a cheque of K200,000 of district funding to support rehabilitation works at the Koroba District Hospital, at an event on Friday Sept 7 in Port Moresby, also attended by Australian High Commissioner Bruce Davis and Oil Search Foundation executive-director Stephanie Copus-Campbell. The rehabilitation is part of a boarder partnership initiative, Wok Bung Wantaim, that is funded by the Australian Government and the Oil Search Foundation. Its isolation and remoteness, combined with damage sustained in the February earthquake in the Highlands, had seen the facility deteriorate significantly. Koroba Kopiago’s district development funds will add to previous commitments from OSF to ensure the facility is returned to full function as soon as possible. Australia has also provided K1.2 million for a new X-ray and pathology facility to give patients access to a more comprehensive range of services at the hospital. “Each one of us – government, donors, churches, NGOs and the private sector can do a lot to support improved health services," Thomas said. Davis said that Australia was pleased with the expanding partnership that would deliver better health outcomes in Hela. “I am delighted that Australia, working with OSF, churches and NGOs, can support the Hela Provincial Health Authority, local "Members of Parliament and their District Development Authorities," he said. "This partnership will improve health services for the people of Koroba-Lake Kopigao and beyond. “Australia is working with all its partners in Koroba-Lake Kopiago to deliver not only on the restoration of services post-earthquake but improving those services to meet the growing needs of the district. OSF is working closely with the Hela Provincial Health Authority to manage the project on behalf of the Koroba-Lake Kopiago District Development Authority, in partnership with Australia and others. Commending commitments made so far, Copus-Campbell said the partnership and rehabilitation work was a step forward to improving health services to people of the district. “District hospitals are an important part of Government’s health service delivery framework," she said. A fully functional district hospital, such as the Koroba District Hospital, brings essential health care services closer to communities, especially as they operate closer to the communities they serve compared to larger provincial hospitals. Australia is separately funding the reconstruction or refurbishment of other social infrastructure in Koroba-Kopiago District, collectively worth around K8 million. This infrastructure will include Kopiago Health Centre, Fugwa Primary School, Fugwa Health Centre, and Koroba Police Barracks.